Map courtesy of Northern Natural Gas Co.
Project: Northern Lights 2019 Expansion Project, Northern Lights Gas Co.
Northern Natural Gas Co. (Northern Natural) has filed an application with the US Federal Energy Regulatory Commission requesting authorization of its Northern Lights 2019 Expansion Project. According to Northern Natural, the proposed project is required to provide additional gas for customers associated with increased energy needs in Minnesota, USA, that cannot be met by its existing infrastructure. Northern Natural held an open season in 2017 to affirm and quantify market growth opportunities, to solicit interest for firm transportation service, and to identify the need to construct facilities necessary to provide firm transportation service on Northern Natural’s system commencing on or after November 1, 2019. From the open season, Northern Natural identified firm load requirements for Xcel Energy and CenterPoint Energy, two local distribution companies, to support expansion projects proposed for commercial and residential needs in the greater Minnesota and Twin Cities area. The project will span several counties in Minnesota, USA, and will allow Northern Natural to deliver 101,411 dekatherms per day of incremental peak day capacity. The Northern Lights 2019 Expansion will include the construction of a new compressor station (Carver Compressor Station) and modifications to the existing Faribault and Owatonna Compressor Stations. The Carver Compressor Station will utilize one 11,153-hp (8320-kW) Solar Taurus 70-108202S gas turbine-powered compressor. The Faribault Compressor Station will utilize one 15,900-hp (11,861-kW) Solar Mars 100-16000S gas turbine-powered compressor. The Owatonna Compressor Station will utilize one 15,900-hp Solar Mars 100-16000S gas turbine-powered compressor. A 3.1-mi. 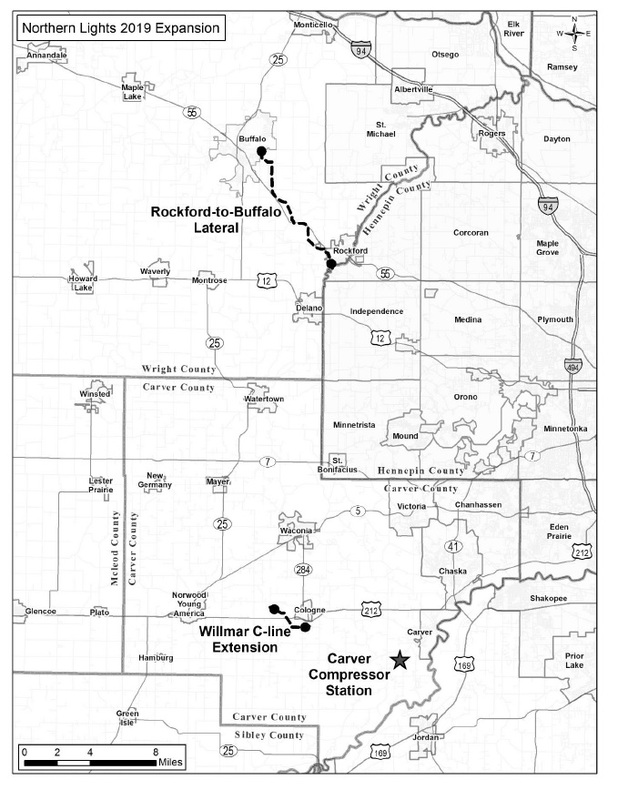 (4.9-km), 24-inch (609-mm) diameter extension of the existing Willmar C-line in Carver County. The estimated cost for the Northern Lights 2019 Expansion project is US$ $158 million.